Patient who suffer from acute appendicitis may complain of pain the periumbilical region which is vague in nature and later radiating and become localized to the right lower quadrant of the abdomen. Besides that patient may present with signs and symptoms such as fever, anorexia, nausea, vomiting. In worst case, patient may suffer from perforation and gangrene as well as peritonitis. Besides pain the abdomen, patient may also complain of pain with passive flexion and internal rotation of the right hip ( positive obturator sign) and pain on passive extension of the right hip ( positive psoas sign). 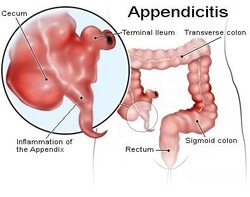 Appendicitis is the commonest surgical emergency which require appendectomy. Appendicitis is caused by obstruction of the appendix by foreign bodies, fecalith, inflammation and neoplasm. There will be infiltration of the neutrophil which affect the muscularis layer of the appendix with congested vasculature ulcerated lesion and formation of the abscess. The appendix will appear swollen red with fibrinous exudate. 1.Carr, Norman J. “The Pathology of Acute Appendicitis.” Annals of Diagnostic Pathology 4, no. 1 (February 2000): 46–58. doi:10.1016/S1092-9134(00)90011-X. 2.Butler, Colley. “Surgical Pathology of Acute Appendicitis.” Human Pathology 12, no. 10 (October 1981): 870–878. doi:10.1016/S0046-8177(81)80190-6.